The first time I photographed Jidai Matsuri (Festival of the Ages) more than a decade ago, I had no idea what to expect. I knew only that it was one of Kyoto’s big three festivals (along with Gion Matsuri and Aoi Matsuri) and that sometimes geisha and maiko appeared in it. Because I had no expectations, that first year was pure delight. I waited outside the Kyoto Imperial Palace on Imadegawa Dori with thousands of other people. I didn’t know it then, but the parade contains 18 different groups, with each group representing an important historical period in Japanese history, hence the name Festival of the Ages. The parade goes in reverse chronological order, so the procession begins with a group from the Meiji Period (1868-1912) and ends with a group from the Heian Period (794-1185). I remember being disappointed by the first few groups that passed. I made some photographs to get my timing and composition down, but the historically accurate costumes of these later periods were not visually interesting to me. I started to get more excited when the Procession of Edo Period Ladies approached. None of the maiko or geisha I know appeared that year, but I was fascinated by the different hairstyles and kimono the women were wearing. I ended up taking hundreds of photos that day (this was so long ago that I was still using a 35mm film camera, not a DSLR), and two groups of images really stood out to me: the photographs I made of the women from the Edo and Heian periods, and those of the helmets and armor of famous warriors, especially from the Momoyama, Muromachi, and Yoshino periods. Most of these images appeared in my second book, One Hundred Views of Kyoto. I didn’t think about why I liked the styles from the Momoyama, Muromachi, and Yoshino periods in particular. I had little time to think as the procession passed by and just photographed what struck me. I liked the colors and the ornate helmets and armor, so I photographed these men, mostly from behind since their faces didn’t always match their garments. I discovered a few years later that there was a reason I liked these 3 periods in particular when I found the book Basara by Tenmyouya Hisashi at a bookstore here in Kyoto. I knew of the artist Tenmyouya Hisashi from his book Kabuki-mono, which I had bought a few years earlier. His paintings mix traditional Japanese themes with modern technology and a kind of punk rock aesthetic, which I like. When I picked up the book Basara, I had no idea what it was, but I recognized some of my favorite artists from the images on the cover, including Yoshitoshi and Kuniyoshi. I was intrigued. I became more interested when I opened the book and saw that it was in both English and Japanese. And then I noticed the book’s subtitle: “Japanese art theory crossing borders: from Jomon pottery to decorated trucks.” Art theory? Decorated trucks? What? 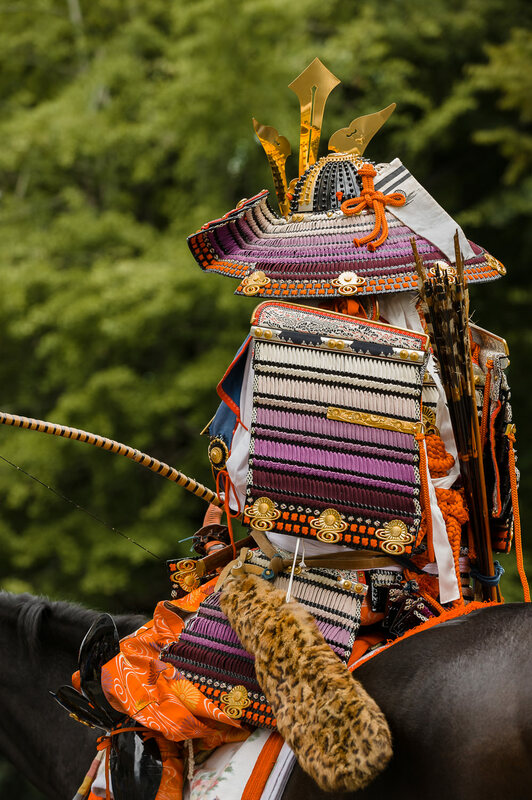 I flipped through the pages and found many striking images, some I had seen many times before and others that were completely new to me, including several photos of samurai helmets like the ones I had photographed in Jidai Matsuri. A few paragraphs later in this Declaration of War, Tenmyouya mentions Basara in the Muromachi Period, and several of the photos in the book feature armor and helmets from the Momoyama Period. I realized that I had been attracted to Basara without even knowing what it was. The photographs I was making of the warriors in Jidai Matsuri were examples of the splendor and excessive beauty of Basara. And this is why I love Kyoto so much. Where else can I get a lesson in history and aesthetics every year that comes alive and literally walks right down the street in front of me? It’s amazing!